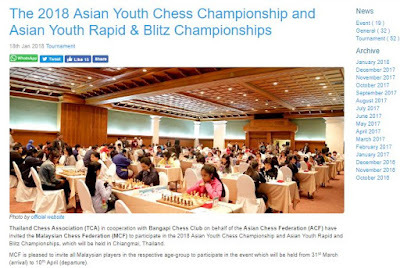 For the Malaysian Chess Federation (MCF), a very positive outcome from the Asian Summit held in UAE last December was significant help from the Asian Chess Federation with a grant given towards helping us organise a FIDE Arbiter Seminar. This is also going to be an arbiter refresher course for existing arbiters and which is very timely indeed given the changes of the laws of chess and some marked trends which are affecting regulations. 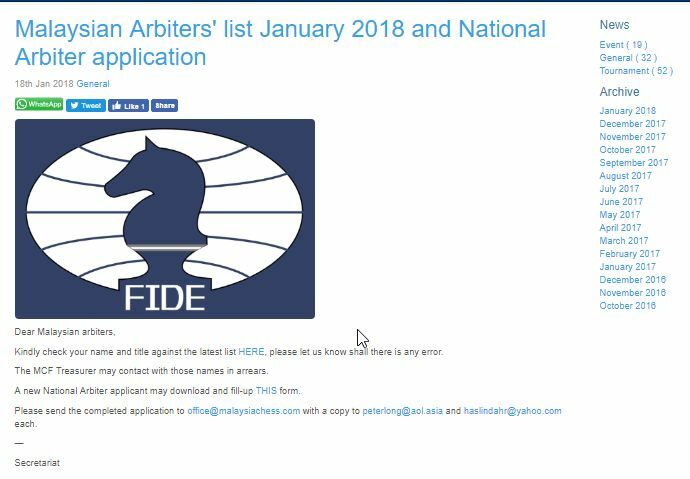 With this MCF has also published a directory of our current FIDE Arbiters and introduced a new process for qualified individuals to apply to become National Arbiters. It is well known that when Abd Hamid Majid left as MCF Secretary many years ago, so did all the assets and in Gregory Lau's time, new assets never really did seem to accumulate. 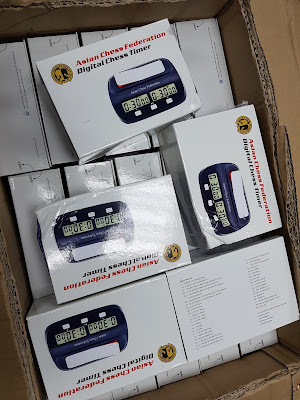 So I was very grateful to Hisham Al-Taher, General Secretary of the Asian Chess Federation, for agreeing to give us 100 chess clocks, 50 of which I was able to carry back with me, and another 50 which will be brought over by Casto Abundo Jr, Executive Director of the Asian Chess Federation, when he comes over to conduct the FIDE Arbiter Seminar. So much of Malaysian chess (as in most of the rest of the world) revolves around kids who play chess and with the Asian Youth Championships in neighbouring Thailand in April, it was matter of urgency to let our community know how they could participate. The solution was of course to open it up to all, the only caveat being that their respective state chess associations needed to endorse their participation. Of course there was still an administrative fee charged by MCF - we are all volunteers and while we do not charge for time, surely some of the expenses incurred by the Secretariat as a whole should be subsidised - and RM 100 is just half of the amount of what was previously asked. What is the other question now being asked? Yes, it is how to qualify for the official place. Very simple indeed, just win your respective category at the coming National Youth Championships!